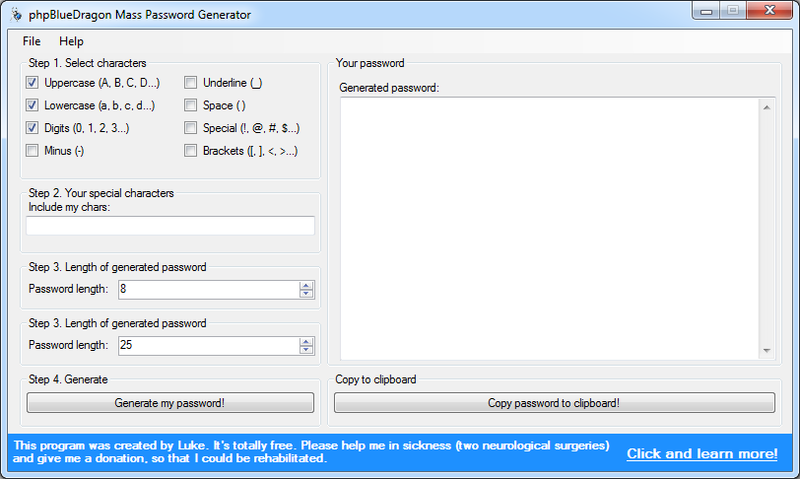 The tool permitting to generate to you the collection of hard passwords, not being with words coming from the dictionary. The application of such passwords facilitates to users by means of the method brute-force will get for account of in the any facultative service. Really the possibility of choosing from among capital letters, lower-case letters, figures, the sign of the minus, the underscore character, the space, special characters, parentheses and personally entered signs in the special field. One can also choose the length of generated password and the quantity of passwords which are supposed to be written out behind one pressing of the button Generate password. Thanks to the use of the program you will create much safer passwords than these which yourself you invent. The requirements are absolutely without which you can not use the software due to its construction and to facilitate the interface for the user. Because I used a few ready-made components and software solutions I put all the information about their authors as required.